It’s not just German Chancellors, government officials and suspected organized crime members that are concerned about privacy on their mobile devices. And getting a James Bond type encrypted cell phone is much simpler, and less costly, for practically everyone in the USA. Here is a review of the three most recent entries into the secure smartphone arena. Boeing Black’s security is powered by the Boeing PureSecure architecture, which was designed from the outset for the mobile environment. Our architectural foundation is built upon layers of trust from embedded hardware, operating system policy controls, and compatibility with leading mobile device management systems. The device’s hardware roots of trust and trusted boot ensure the device starts in a trusted state, enabling maximum security of data. Hardware media encryption and configurable inhibit controls are embedded to protect the device, its data, and the transmission of information, significantly reducing the risk of mission compromise due to data loss. 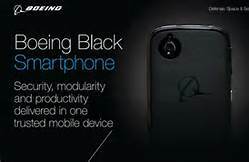 Boeing Black operates on the same frequencies and standards as your regular commercial phone (WCDMA, GSM and LTE) and offers secure WiFi and Bluetooth connectivity. It has a few distinct features you won’t find in a standard phone like a tamper-proof case that will delete all the phone’s data and render the device to be no more useful than a paperweight. No information yet on the price, or when it may become available for non-government personnel. At the other end of the design spectrum is the “Privacy Phone” from maker FreedomPop. The actual hardware is just a Samsung Galaxy II. You don’t need a contract. For an initial $189, you get the phone and three months of unlimited voice and text, plus 500 MBytes of data. After the three months, it’s only $10. For the person with serious security concerns, or just wants total anonymity, you can make all your payments Bitcoin through the BitPay service. In light of recent violations in consumer’s privacy across social networks and mobile devices, privacy is becoming increasingly important to many Americans and we all have a right to communicate anonymously. Large carriers don’t have the flexibility, desire or creativity to invest in privacy. We don’t agree with this approach and felt it was up to us to create a truly private mobile phone service at an affordable price. The handset uses a fairly robust 128-bit encryption (similar to what is used for banking transactions) to encrypt communication for voice calls and text messages. Another nice feature is that this smartphone enables anonymous internet browsing wherever you are and whatever sites you visit. Falling in-between the offerings from Boeing and FreedomPop is the “Blackphone” from SGP Technologies. This is a custom designed phone which is built using their own secure production line. The hardware includes a 2GHz quad-core system-on-a-chip (SoC) processor, 4.7-inch 720p IPS screen, 2GB of RAM, 16GB of storage, a primary 8-megapixel camera with flash, and a 1.3MP front camera. The mobile privacy is provided from Silent Circle with its custom version of Android OS called PrivatOS, This includes pre-installed privacy tools, including their proprietary suite of apps (Silent Phone, Silent Text, and Silent Contacts); anonymous search, private browsing, and VPN connections. There is no such device that is NSA-proof. If you are on the terrorist wanted list or a criminal, intelligence services will get into your device. There’s no such thing as 100% secure phone. [However] PrivatOS will allow users to control every part of what data their phone is leaking, their calls, their contacts, their web browsing and what any app put on their phone can do. The Blackphone, which will only be sold unlocked, is priced at $629 with production shipments in mid-2014. A recent Wallstreet Journal article (3/5/2014) reported on a Forrester Research survey which found that 8% of Internet users have downloaded services in order to monitor which companies are tracking their on-line browsing habits. Other articles are indicating that more people are concerned with their data privacy, more so from advertisers than from any government agency. Look forward to more smartphone makers to be implementing security features going forward as part of their devices. And for service providers to include this as a service offering. Just don’t expect it to be free.